Mein Führer, I need a "free" power chair at no cost to ME. I'm already scared to death about the damn statists. Then I get up this morning just in time to see Obama spewing on the TV with a bunch of Obama-tards screaming behind him. Now I log on and see this. Is this Black Friday or something? I think it captures the conflict well -- the warm fuzziness of the title's words is in contrast to the cold illustration. It represents the blind hope of a beneficent tyrant in contrast to the truth. Though perhaps the SWAT/soldier should be facing the guy. Or perhaps the guy's arms should be swung wide open, aiming to embrace a soldier covered in spikes standing in front of him. Ok, I give up, T. Is it an anagram related to Dr. Strangelove? Since this is a textbook cover & John changed "bomb" to "state," I thought it only proper to have a new doctor of Prussian edumucation. The new doctor's name is a phonic. Read it fast with no breaks. Just something silly that popped in my head. Not whiff at all, T -- I like it now that you explained it! 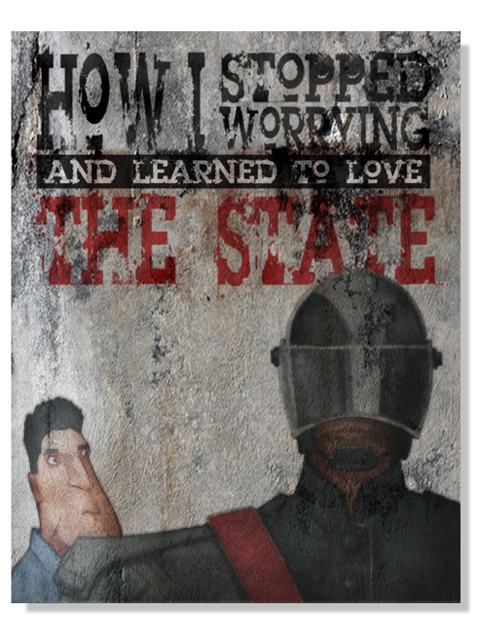 Mostly, I enjoyed toying with the idea that a farcical social studies text book would inspire ridiculous "civic lessons" on obedience, conformity and the eternal joy of Big Brother's Love. Think Swift's "A Modest Proposal"... though it's more about putting a smiley face on statism. IMO We shouldn't even be discussing this piece,nothing against John. It's a sign of the times and he's all over it. But, No...Yo said it all in four numbers. Definitely a sign of the times, given the current administrations use of NewSpeak. This page contains a single entry from the blog posted on October 5, 2012 12:31 AM. The previous post in this blog was Wooing The Middle. The next post in this blog is Novel Cover Illustration Idea.